One of our favorite traditions is making grateful paper plate turkeys each year! A few years ago I shared our simple tutorial for this project and we did it again this past week with all three of my kids. I thought it was really neat to see the variation in the projects across the different ages! My kids are ages 3, (almost) 5, and (almost) 8. This craft activity is so easy and can be adapted depending on your child's age! We always get started by decorating the backs of our paper plates using our Do A Dot markers! Next the kids cut out turkey bodies (I usually cut one out for my toddler) and the kids add googly eyes, a beak, and a red gobbler. I usually pre-cut the materials for my toddler and let my preschooler and elementary schooler cut their own. Next we glue the turkey body onto the paper plate and while the glue dries we brainstorm all of the kids we are grateful for! Then we cut out some feathers and write what we are grateful for on them! My toddler dictates to me and I write for him... my preschooler tries her best to sound her words out alone and then I help her if she needs help (I write a word and then she copies it onto her paper) and then my elementary schooler is pretty independent writing his own words. My kids are always SO PROUD of their grateful turkeys once they are done and we display them where everyone can see them all November long! My older kids have been adding and adding to their turkeys all month long. I think my oldest son's turkey had at least 20 feathers. I am so grateful that he has so many things to be thankful for! He is such a sweetheart! This craft could also be easily turned into a gift. Just make one for someone special and write all of the reasons you are grateful for them on the feathers. 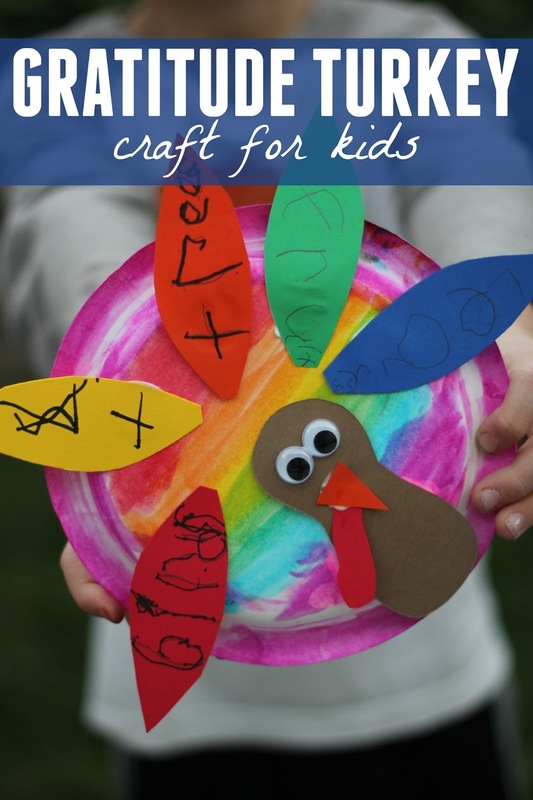 Make a special plate of treats and stick this turkey craft to it and you can deliver it! 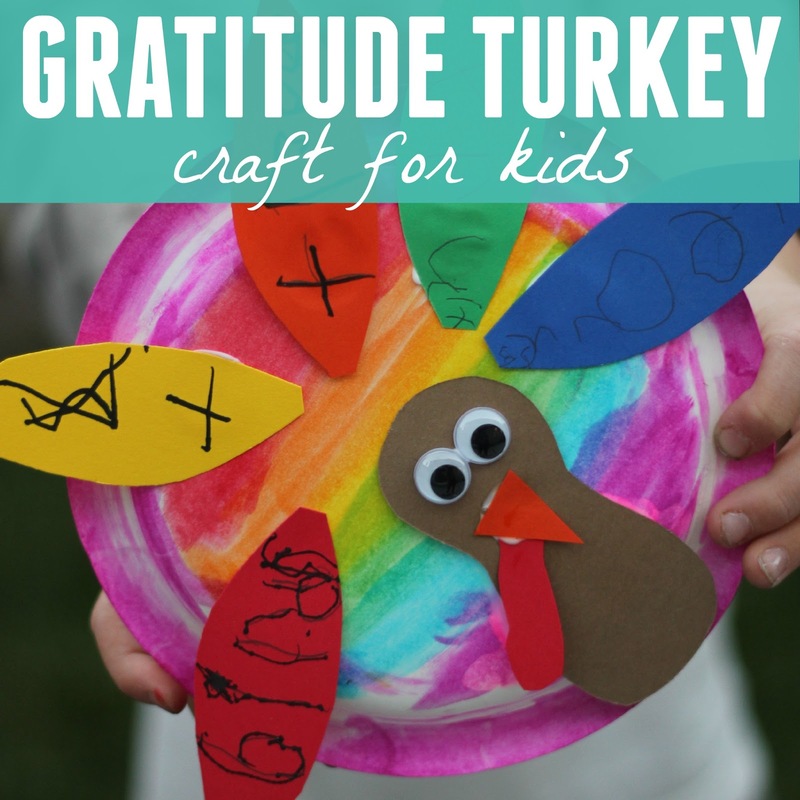 You could also make this gratitude turkey treat that is always a favorite. Do you have any favorite Thanksgiving traditions or turkey crafts that you love to make every year? You can find all of our favorite Thanksgiving activities over on our Thanksgiving Pinterest board! We have tons of great ideas pinned!